Preheat the oven to 160°C/325°F/Gas Mark 3. Mix the gremolata (Italian chopped herb condiment) ingredients together and set aside. Cut the white sinew from the kidneys, then cut into bite-sized pieces. Heat a frying pan on a high heat, season the kidneys and add some of the oil to the pan. Add the kidneys and sauté quickly, just until coloured, then drain. Open the lamb saddle, with the pork caul underneath it, and put the two small fillets in the centre, where the bone used to be. Season well with salt and pepper, then smother the meat with the gremolata in an even layer. Arrange the kidneys in a line in the centre, on top of the fillets. Tightly roll the lamb in the pork caul and tie with string at intervals. Season the lamb, heat a large ovenproof frying pan on a medium heat and add the remaining rapeseed oil. Sear the lamb until golden brown. Add the butter, rosemary and garlic, transfer to the oven and roast for 20 minutes, turning every 5 minutes. Rest for 15 minutes before carving. Serve with vegetables. For the amaretti biscuits, preheat the oven to 160°C/325°F/Gas Mark 3 and line two baking trays with baking parchment. Mix the ground almonds with half the sugar in a bowl. Whisk the egg whites to soft peaks, then whisk in the remaining sugar a little at a time, to make a meringue. Whisk in the amaretto and almond extract, then gently fold the meringue mixture into the almond and sugar mixture until you have a thick paste. Put the mixture into a piping bag and pipe medium-sized circles or fingers on to the baking trays. Bake for 25-30 minutes, until golden brown. Leave to cool on the trays, then store in an airtight container. For the cherry and kirsch jelly, put the kirsch, stock syrup and spices into a saucepan and bring to the boil. Take off the heat and let sit for 10 minutes. Put the gelatin sheets into iced water and, once soft, squeeze out the excess water. Mix the gelatin into the liquid, then strain through a fine-mesh sieve. Line a tray at least 2cm deep with cling film and pour the kirsch liquid in, to about 2cm deep. Put it into the fridge to set. For the vanilla custard, scrape the seeds from the vanilla pod and put both the seeds and pod in a saucepan with the milk and cream. Slowly bring to the boil and set aside. Whisk the sugar and egg yolks together in a bowl, then whisk in the hot milk mixture. Pour back into the saucepan and heat gently, whisking until it thickens. Cool. For the cherry compote, put the cherries and sugar into a saucepan and cook until the cherries have softened and released their juices, then remove from the heat and cool. For the whipped cream, scrape the vanilla seeds from the pod into a bowl with the whipping cream and sugar. Whip the cream until soft peaks form. To assemble the trifle, put the Marsala and sugar into a mixing bowl. 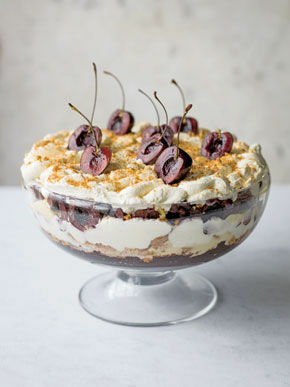 Start by piling a layer of the cherry compote in the bottom of your glasses or trifle bowl. Soak a few amaretti biscuits in the Marsala, then place on top of the compote. Cut some cubes of cherry jelly and scatter over the amaretti, then cover with custard and whipped cream. Add another layer of compote, soaked biscuits, jelly and custard. Pipe whipped cream on top, then crush a few amaretti biscuits and sprinkle on top with cherries.